This entry was posted on April 15, 2015 at 4:00 pm	and is filed under Uncategorized. Tagged: aircraft performance, comparision, parameters. You can follow any responses to this entry through the RSS 2.0 feed. You can leave a response, or trackback from your own site. Is span loading that important? If I recall correctly, higher span loading means stronger vorticies. Actually, could you list the FLX stats as well for comparison? Higher span loading means stronger *wingtip* vortices, which means higher drag (in both level flight and turn). It’s pretty interesting to see that the FLX dominates most of these categories. It’s only span loading that the F-16 and the Draken are slightly better (and a modern YF-16 I’d imagine would work even better). The Harrier is not really competitive as an air superiority fighter so it doesn’t count here. OF course there are other flaws with the Draken (rear visibility isn’t too good), but everything else looks solid – provided it had a better engine. The main weight savings of the FLX seems to be the radar deletion and the exclusion of unneeded (and often costly) avionics. Interesting but not really surprising considering that the FLX, F-16A and J-35 are the only purpose-designed air superiority fighters on the list, and the FLX is far newer and more advanced in terms of aerodynamic configuration and materials used. >>Delta wing allows good lift-to-weight ratio due to the large surface area and relatively low weight of the wing itself. One of reasons for its good lift production is that large part of the wing area is near the wing root, and is thus less affected by the spanwise loss of lift which occurs towards the wing tips. Nonslender delta wings (<55* wing sweep) allow for air flow reattachment even after breakdown reaches the apex of the wing, however vortex generating surfaces (LERX and close-coupled canards) are required for flow reattachment at high angles of attack in the post-stall region. Flexible wing can increase lift and delay stall compared to the nonflexible wing of the same geometry. This effect is helped by vibrations which promote reattachment of the shear layer and thus lift enhancement. Moderate wing sweep angles (around 50°) help formation of semi-open separation bubbles, helping flow reattachment.<>Lower-swept wing (44-45*) is less affected by negative effects of downwash on wing lift than higher-swept wings (60*), and presence of the canard may cause it to produce significant amounts of the side-edge vortex lift on the low swept wing.<=45* and aspect ratio of <3,5. FLX has wing sweep of 50* and aspect ratio of 2,23. Compare this to Rafale's wing sweep of 48* and aspect ratio of 2,55 (note that when compared to Mirage, Rafale has reduced wing sweep (48* vs 58*) and increased aspect ratio (2,55 vs 2,03) specifically for purposes of increased maneuverability). Typhoon has wing sweep of 53* and aspect ratio of 2,4, Gripen has wing sweep of 45* and aspect ratio of 2,35, Draken has aspect ratio of 1,8. "– Amongst the real world fighters, the Rafale is probably the best"
"– With a better engine, the specs suggest the Saab Draken would be a good fighter with most of the advantages of the FLX"
Better engine and stronger composite airframe. It might be somewhat let down by its low aspect ratio wing, and it has issues with cockpit visibility and larger size. But then again, compound delta might well be the second best thing after close coupled canards when it comes to maneuverability – note that both Rafale and Typhoon were originally suposed to have compund delta wings, but it was changed to straight delta for sake of simpler production and maintenance. Rafale does have LERX, which offers mostly same advantages as the compound delta configuration, though not as pronounced. "The main weight savings of the FLX seems to be the radar deletion and the exclusion of unneeded (and often costly) avionics." Yeah I can see the road mobility being the issue. But that adds mass and complexity, although it might allow more aircraft on an aircraft carrier. Something like this might be of use on a carrier based FLX though. It’d be interesting to see how the “cranked arrow” delta affects speed and handling characteristics. I wonder if a compound delta could be pared with canards. But yes, I agree that the composite technology is the main savings that I neglected – that and the hardpoints (no air to ground needs for bombing and no needs to super heavy missiles). I have wondered for the French, why not make an air to air variant without the heavier hardpoints? I’d rather avoid it if at all possible. 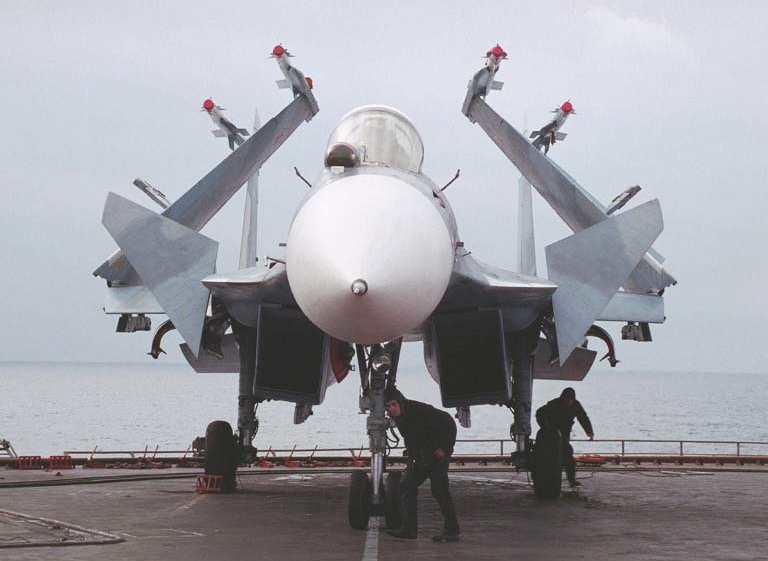 Not only does it add mass and complexity, it also limits maneuvering capability – IIRC, folding wings are one of reasons why carrier-borne F-18s and Su-33s cannot achieve more than 7,33 g. FLX has strong enough airframe that even a carrier version can achieve 9 g, but I doubt it would be possible with folding wings. Compound sweep (cranked arrow) delta basically has benefits of a huge LERX: high inboard sweep promotes formation of vortices at high angles of attack, reduces wave drag and also moves most of the wing out of the shock cone even once it passes wing tip. Low outboard sweep reduces span loading and thus induced drag. However, both Rafale and Typhoon switched from compound delta to simple delta in order to simplify production and maintenance, though Rafale emulates some of advantages of compound delta with its LERX (note that in terms of cruise performance the FLX has an effective wing sweep of 54* despite nominal wing sweep of 50* due to its LERX). Rafale was supposed to provide savings by replacing many different aircraft with a common airframe. Making an exclusive air-to-air version of what is already air-to-ground capable air superiority fighter would mean different production process, low parts commonality when it comes to airframe at least (different, lighter wings, no targeting pod hardpoints under the intakes etc. ), and cost wouldn’t be reduced by too much (maybe 25%, since size would not drop and size was actually dictated by air-to-ground requirements). That’s the worry. Against this, the only potential advantage I could see with folding wings is the ability to add more aircraft into a carrier, but yeah the ~7G limit (versus 9G) is a pretty big drawback. I suppose that was probably due to costs. I’d imagine a cranked arrow design (possibly with canards) would be a “money no object” sort of thing that would be expensive, but not much better than the leading edge normal delta. The other question becomes how much more in terms of cost and maintenance it would have been. The other is how good the performance gain would be. That being said, the Eurofighter seems to be getting more costly with each new tranche. It’s a pity – 2 airframes would have worked better. Whether it will achieve that is open for debate. The issue I see is that a typical fighter like the F-22 today is on a base with lots of technicians, spare parts, and what amount to ideal conditions. War time conditions are not like that at all. Disruptions in supply chains, spare parts shortages, and rough hangars are the norm. What will that do to the already bad reliability? Which can be found online, but the full report seems to be gone. More expensive and possibly more maintenance intensive as well. The issue here is that the original justification for the F-35 was the VTOL in forward bases, but if that’s not possible, then the rationale loses all justification. Eh, F-35 will never operate from forward bases in any meaningful way. USMC wanted STOVL so that they can have some air power on their assault ships if Navy decides to pull Guadalcanal and leave them without air support. Only problem is that USMC have their priorities wrong – what they need is not STOVL aircraft to operate from amphibious ships but dirt strip STOL fighter to operate from forward shore air fields. You know I’ve been thinking – the next fighter aircraft will likely prove even more expensive and complex than the F-22 and JSF. Back when the airforce wanted to replace the F-111, they came up with a clone which became the FX. There probably will not be a set of defense reformers this time to save the day. Sad but true. Even if it really turns out to be UCAV, it will be just as large, but far more expensive than, modern fighters. The question is when it will end. The defense death spiral will at some point, endanger the financial viability of the US. Indeed it may already be doing that. Stiglitz has indicated around ~$6 trillion. The issue is whether or not the US will reform when it is faced with dire financial situations in the future. Do the wing loading stats include body lift? Yes and no. Take a look at my air superiority fighter proposal to see how wing loading is calculated. So the body lift is an estimate provided by extending the wing area directly into the fuselage? I understand how that works with the top picture simply extends the leading and trailing edge until they meet the opposite wing’s leading and trailing edge respectively, but the bottom picture is basically a parallelogram. No. That is how wing loading is calculated. Lifting area depends on aerodynamic configuration and flight conditions. That being said, classic wing loading calculation accounts for most of the body lift, but does not account for lift improvement by high lift devices such as strakes, LERX and close-coupled canards. Consequently, in F-35 vs Rafale/Gripen debates, “wing loading is not indicative of turning ability” argument actually works against the F-35 and not in its favor since canards can increase wing lift by as much 30-35% (again, depending on configuration; IIRC, it is ~30% in Rafale), which is more than the F-35s stealthy “chimes” can hope to achieve. There is still a “wing” in that picture, including leading and trailling edges. Actual wings are very small, but main point is that “wing area” in there encompasses empty area between the tails as well. Out of curiosity, why are chines so ineffective? I suppose that they are ‘static’ and cannot change their position whereas canards can change AoA and are thus ‘dynamic’. The F-35 looks to have a decent amount of LERX. Using the good old ruler on the screen and some math I find that the F-35 (not including LERX) has a wing area of 460 ft^2 and wing loading at 40,000 lbs is 87 lbs/ft^2. With a wing area of 300 ft^2 and a weight of 23,000 lbs, the F-16C-50 has a comfortable wing loading of 77 lbs/ft^2. In general comparison, LERX has the advantage in cruise flight in that it modifies the Mach line and increases cruise speed. In turning flight, it creates two sets of vortices. However, unlike canards, LERX cannot adjust itself to flight conditions; it is fixed. Canards, on the other hand, can be set for maximum lift enhancement, maximum lift-to-drag ratio or minimum drag. Typically, they are configured for maximum lift during first second or so of the turn, and minimum drag later on. Canards can also be better adjusted for covering wing with vortex flows – whereas LERX typically only energizes inboard portion of the wing and thus helps lift, canards energize inboard and outboard portions of the wing, helping both lift and wing response to aeliron input, which has the effect of increasing roll onset rate and consequently transient performance.